The 2010 Haiti earthquake was a very strong earthquake that hit Haiti on January 12, 2010. On the scientific scale that measures the magnitude (or strength) of an earthquake, the quake scored a magnitude of 7.0 Mw. The center of the earthquake was near Léogâne, very close to Port-au-Prince, the capital and largest city of Haiti. It was only about 25 kilometres (16 mi) west. The earthquake hit in the afternoon, at 16:53:10 local time (21:53:10 UTC). Haiti already was the poorest country in the western hemisphere, and was not able to take care of all the people that needed help. About three million people were affected by the earthquake, many homes were destroyed. Three days after the earthquake, the Haitian Interior Minister said that up to 200,000 had died because of the quake and its effects. This was many more deaths than officials originally thought. At first, the Red Cross had guessed a much smaller death toll of 45,000–50,000. The earthquake caused major damage to Port-au-Prince. Most major landmarks were badly damaged or destroyed. The Presidential Palace, the National Assembly building, the Port-au-Prince Cathedral, and the city's main jails were all destroyed. The president at the time, René Préval, survived. Most hospitals in the area were destroyed, which made things much worse. The headquarters of the United Nations Stabilization Mission in Haiti (MINUSTAH) in Port-au-Prince collapsed. The Mission's Chief (Hédi Annabi), his deputy, and the acting police commissioner were killed in the quake. Elisabeth Byrs of the United Nations (UN) called the earthquake the worst disaster the United Nations had ever had. This was not just because of the property damage and deaths from the earthquake. The roads, phone lines and government buildings of the UN in Haiti and the Haitian government were also destroyed, so trying to just get organized and get help to the people was a real problem. So many people died in such a short time, that they used dump trucks to haul the dead bodies to mass graves. Heavy-lifting helicopters fetch water from the offshore flotilla, 15 January. Many different countries started raising money and sent medical teams or search and rescue teams to Haiti. The Dominican Republic, which is next to Haiti, was the first country to give aid. This helped reduce some bad feelings between the two countries that had been there a long time. But it takes a long time to rebuild a city and the area around it. Just finding places to move all the broken parts of buildings was difficult. And countries promise money to help rebuild, but it takes a while to get the money, and in most disasters, only half the money that is promised is actually sent. (This doesn't count millions of dollars that people gave directly). For years many people were living in tents, wherever they could find room. And workers for the UN introduced cholera to the country in October 2010, which made many people sick and killed thousands more. The country is still recovering. ↑ Lin, Rong-Gong; Allen, Sam (26 February 2011). "New Zealand quake raises questions about L.A. buildings". Los Angeles Times. Archived from the original on 3 March 2011. Retrieved 27 February 2011. ↑ Kolbe, Athena R.; Hutson, Royce A.; Shannon, Harry; Trzcinski, Eileen; Miles, Bart; Levitz, Naomi; Puccio, Marie; James, Leah et al. (2010). "Mortality, crime and access to basic needs before and after the Haiti earthquake: a random survey of Port-au-Prince households". Medicine, Conflict and Survival 26 (4): 281–297. doi:10.1080/13623699.2010.535279. PMID 21314081. ↑ "USGS Magnitude 7.0 – HAITI REGION". Retrieved 13 January 2010. ↑ "CIA World Factbook - Haiti". CIA. Retrieved 16 March 2013. ↑ "Red Cross: 3M Haitians Affected by Quake". CBS News. 13 January 2010. Retrieved 13 January 2010. ↑ Sutton, Jane; Anthony Boadle, Pascal Fletcher (15 January 2010). "Haiti quake death toll may hit 200,000-minister". Reuters Alertnet. Reuters. Retrieved 15 January 2010. ↑ Fournier, Keith (13 January 2010). "Devastating 7.0 Earthquake Hammers Beleaguered Island Nation of Haiti". Catholic Online. Retrieved 13 January 2010. ↑ "Quake 'levels Haiti presidential palace'". Sydney Morning Herald. 13 January 2010. Retrieved 13 January 2010. ↑ "UN: Haitian capital's main jail collapsed in quake". 13 January 2010. Retrieved 13 January 2010. ↑ "Dems' Haiti Fundraising Email: 'Put Politics Aside For A Moment". Talking Points Memo. 14 January 2010. Retrieved 14 January 2010. ↑ "Briefing by Martin Nesirky, Spokesperson for the Secretary-General, and Jean Victor Nkolo, Spokesperson for the President of the General Assembly". United Nations. 13 January 2010. Retrieved 13 January 2010. ↑ "Clinton visits quake-hit Haitians". BBC News. 16 Jan 2010. Retrieved 16 Jan 2010. ↑ de Montesquiou, Alfred; and Mike Melia (16 January 2010). 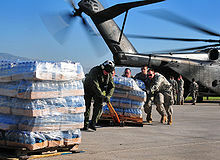 "Haiti earthquake survivors get more food and water (AP)". Tampa Tribune Online. Retrieved 17 January 2010. ↑ "Charities plead for Haitian aid". The San Bernardino Sun. Retrieved 16 January 2010. ↑ "Tensions Mount in Haiti Amid Plea for Aid". SKY News. Retrieved 16 January 2010. ↑ "Thousands feared dead after powerful Haiti quake". The Miami Herald. Retrieved 16 January 2010. ↑ 19.0 19.1 "Dominican Republic aid to Haiti eases historic tensions – CNN.com". Edition.cnn.com. Retrieved 15 January 2010. ↑ "Appeals for aid after quake strikes Haiti". CNN. 13 January 2010. Retrieved 13 January 2010. ↑ Reuters (3 January 2007). "Wyclef Jean to be Haiti's roving ambassador". MSNBC. Retrieved 13 January 2010. ↑ "Half of money received". Guardian. Retrieved 16 March 2013. ↑ "Cholera in Haiti". USA Today. Retrieved 16 March 2013. This page was last changed on 18 April 2019, at 13:52.